Wow, just wow! We had close to 200 responses to the most recent survey. We asked for your #1 tips and suggestions for writing a GREAT IEP. Thank you to everyone who took the time to respond. Almost all of the responses have been included below. For ease of reading, some duplicate answers were removed. As I read through all of the responses, there are two themes that stood out to me based on what people offered for their tips and suggestions for writing a great IEP. 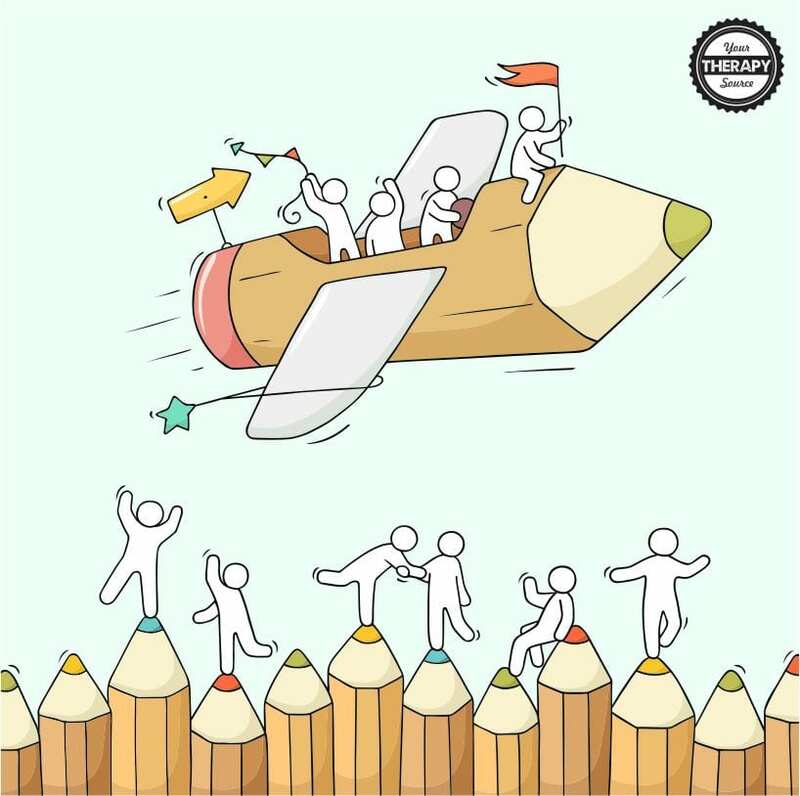 COLLABORATION – many of you responded (with different phrases or remarks) that everyone needs to collaborate with parents, students and other staff members to work together to write the IEP. SMART goals – a few responses stated SMART goals specifically but many others included parts of a SMART goal – specific, measurable and achievable. As you read through the responses, I would love to hear what stands out for you. Send us an email info@yourtherapysource.com and let us know! 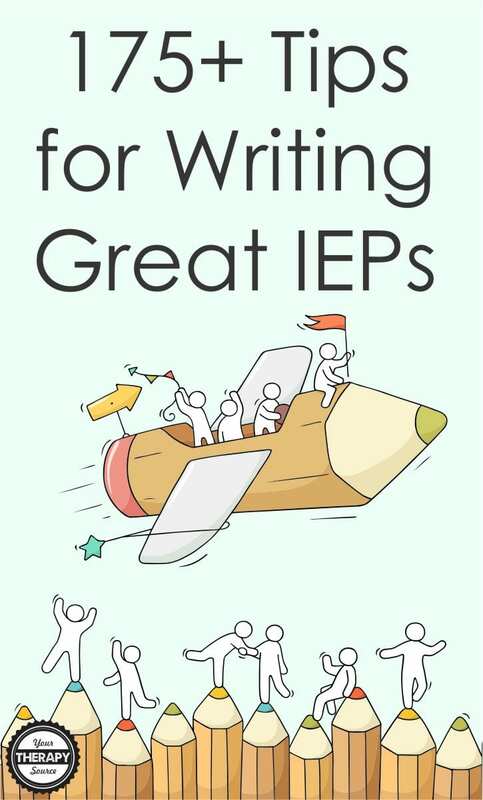 What is your #1 tip for writing a great IEP? Get feedback from teachers, parents and THE STUDENT when setting and writing goals for the IEP. Make sure that your PLEP is a good picture of the child…if another therapist or school gets this kid will they understand them based on what you have written? Making sure that the goals written reflect the current level and interest of the family for the child. Make it achievable as you can always update the IEP. A great IEP should be individualized to fit the changing needs of the child not driven by administrative values like time, money and space. To remember that each child is different and that professionals who participate in developing the IEP have an impact whether the child succeeds or fails. Collaborate with the classroom as to what needs to be worked on so that the goal is relevant and skills worked on a daily basis, not just during OT time. At the high school level, the main focus should be on transition. Integrate on the TOR goal and help the TOR write the goal. Keep information brief with emphasize on data collection for function. Focus on participation skills, not performance skills. Make it functional, measurable and keep it simple. We must consider the students cognitive functioning and write goals and objectives that are developmentally appropriate. Always keep function in mind over everything else. Writing goals that are clear to understand and brevity. Make it parent friendly so they understand what you are saying. Collaborate with IEP team members prior to the actual meeting. Keep it functional – focus on accurate tool use in the classroom (pencil, crayon, scissors, etc) rather than grasp or finger position. Having a good teacher that knows her students to collaborate with for their current needs and future goals to establish student/classroom goals/objectives not OT goals. Try and make the IEP relate-able to what level the student actually is. Remember to view each child as an individual who has strengths and preferences, and try to write the IEP to be inclusive of these strengths and preferences. Collaborating with teachers to get a clear picture of where the student’s needs are and how to best work together to make a plan for success. The IEP should have goals and objectives that are clear, measurable, and created for the student to progress. Encourage the school district to give you more than an hours notice about the meeting. It is difficult to come up with something in short notice. Write your goal and objectives as soon as you complete your evaluation. The meeting may be 3-4 weeks away and you won’t have to start over with planning IEP goals, accommodations etc. for that particualar student. Talk with the classroom teacher that sees the child every day. We call it the “golden thread”. Make sure the present levels, needs, goal, accommodations, etc. consistently pull together the golden thread of what you are targeting for the student. Not only does the goal need to be specific and measurable, but it also needs to be simplistic. I have read numerous goals with three different areas to target and they end up being a paragraph long. Each area should have a specific goal that everyone, not just the therapist can explain. Collaboration with teachers to determine priorities and needs of each student. Goals should be driven by how the disability impacts the students performance in the general curriculum. Create a data sheet as you write your goal so that you are writing a measurable goal. Keep to one measurable variable with modifications/support added. Make sure to get input as to what the teacher/parents’ biggest concerns are and make sure the goal your formulate addresses that concern. Collaboration with your teacher on goals and objectives. Make goals very measurable. It makes your job much easier in the long run. Make information concise and relevant to the setting. Parents and other professionals do not want to know every small therapy detail. Being concise and relevant helps keep the golden thread of the IEP moving. Insure the goals and objectives are measurable. Example : “faded support” is to vague and is subjective. Adding a line like “with 3 or fewer verbal cues” gives you something you can measure…. Collaborate with team so everyone has a good picture of the student as a whole. Look at how the student is functioning in school throughout the whole day, not just how the student is in OT/with you. Include all the information, their pencil and scissor grip, positives and improvements as well was what still needs to be worked on. Why do they continue to need skilled OT? Ensure goals are very ably supported by down-to-earth practical and easily doable strategies. Make sure to meet with the team and get a comprehensive view of everyone’s concerns! This ensure that everyone is in agreement on the goals, and makes it easier for skills to carry over (e.g. increases teacher buy-in for classroom strategies). Write goals that teachers can accomplish when student is not with push in or pull out services. I have found the more clear the better communication is all the way around. Gathering information about how your student is functioning in their classroom, during specials and lunch, during unstructured times such as recess, arrival, and dismissal. Additionally how the student is functioning in their home environment. Also, soliciting feedback from the student’s teachers, other service providers, their parents and from the student themselves can provide invaluable information for writing an accurate and comprehensive IEP. Having good baseline data makes it easier to write an accurate IEP. OTs do not write IEPs in my school district. IEP’s has to involve a panel of professionals, teachers, tutors, therapist/s and the parents who is going work co-operatively with the child’s best interests at heart and a realistic programme has to be discussed that include accommodations for the child. Taking the time & effort to know(ing) your students on lots of different levels & not just be focused on pure academic abilities but personal, emotional mental & social too. Developing & maintaining a sincere, genuine relationship with both the child/ren & family/carers to enable you to know what skills & targets that’re realistic & achievable to work towards together. Collaboration with my classroom teacher! Close collaboration with the case manager! Coordinate with teacher &educational team so everyone is on the same page for working toward student progress & achievement at school. the team to focus its attention. I apply this to working in group, sitting at a desk, wring, gym, recess, social skills, executive function, etc. Frequently we see the true deficit when we observe a child across settings and with multiple teachers. To collaborate with all team members when writing the IEP! Less is more. Be concise and objective. Measurable goals that can go across districts and written so that parents and teachers can understand them. Teachers write the iep, I only attach to teacher written goals but usually we collaborate on the goal. Currently can cut a 6 inch straight line with spring loaded scissors – Will cut a 6 inch zig zag line with or without adaptive spring loaded scissors. Currently can write 22 of 26 lower case letters – Will write all 26 lowercase letters. assume and hold the prone position for 8 minutes while engaged in a fine motor/visual motor task. Making sure that the goals reflect the weaknesses described in the present levels and making sure the goals are attainable and measurable. ability in an isolated therapy environment (out of context of the school setting). Come up with meaningful goals that every team member thinks are useful and will help the student participate at school. Review last year’s IEP notes to be reminded of any sticky issues and to make sure you didn’t miss anything you were supposed to follow up on! Collaborate with as many stakeholders as possible! The more you know about a child, the more effective your IEP. Put information in a chart. Old goals/progress/new goals. Have an IEP map and your data close. The difference in writinga good and bad IEP begin with having data close to be able to see what their strengths and areas of improvement can be! Educational impact is our priority, collaborate with teachers on what is most impacted in the classroom and start there. Collaborate with the team to determine the student’s greatest needs and strengths. Keep a running list of goals you’ve created because you never know when you may use that goal again (obviously change it as needed), but why reinvent the wheel when you don’t have to?! Also, keep a “master IEP” document with tips on writing ieps, including examples of answers to questions that you use and examples of good goals/present levels. You can also keep the Spanish version of things so you’re not always translating if it’s not needed! Our program used to allow time for the entire team to get together to discuss the most important areas to identify in goals as well as modifications and strategies. It really did help in writing an all inclusive IEP. Sadly, this practice did not continue with different administrators and parts are now more done in isolation. Make sure you have collected all your data for reviewing annual goals, determining present level, and developing new goals!!! when writing goals make sure they are addressing the WHOLE chills and are focused around the primary barrier to their development is. Writing 20 goals/objectives broken into 5 domains is rarely effective to make progress especially when working with kids who have a wide scope of needs. When a team collaborates to examine ALL the data, patterns and trends in what the child needs will start to become evident. In many cases their is a self regulation issue that is holding the child back. That has to be addressed before they will be able to work on fine motor or executive function based skills. Collaborate. Make sure every concern that is mentioned in the PLAAFP is addressed in either accommodations and/or goals. Make your goals school related (not scientific sounding), easy to understand and duplicate so that other team members can collect information on the goal; and so the team members will understand the purpose of the goal relating to school function and participation. Remember to write a goal for the concern that presents in the classroom, not what the testing results show. Your data should include information from the concern in the classroom. the abilities/difficulties in your present level should basically write the rest for you – if you paint a good picture of what your student struggles with you will be able to build the IEP from there. Use the Goal Bank to get you started, THEN edit those goals to specifically reflect your students’ needs. Start with strengths and make sure everything connects! Write it so the parents can understand what everything means. Don’t use technical terms. Writing from the positive and what the student can actually do and with what level of support or preparation that is needed for the student to achieve the present level of function. My best tip is to make the goal for the child’s participation in whatever grade they are in and to do push in service as much as possible! I try to be as specific as possible so that if a complete stranger read the IEP, they would have no trouble knowing how to help the student. Collaborate with the teachers and paras. Make sure you get all your information in the online system before it is locked! If not, be ready for having to do even more paperwork. Be sure to include any accommodations your are requesting to be used during the school day so it is part of the legal document (especially for any sensory tools). I recently attended a conference and was told that if an activity can not be carried out on a day to day basis then it should not be written as an objective. Think function! Assess the student’s skills before hand and write observable, measurable goals that match the next step from the student’s level of functioning. Sit down and collaborate/ask for input with the iep team (school and parent) before writing your part of the iep. Keep it child centred and achieveable. Communicate early with family and teachers. I don’t know of any tips. I was told to always start meeting with plans after high school for those students. Elementary, I would say, a career plan. Be very specific about what modifications an accommadations that are needed for this student. It could be a ton more. I have to get ready for the students. You have to be specific–You cannot say student will go up and down stairs…Is he holding the rail? Step to or reciprocating? How many steps? A student may be able to do 4-5, but not a full flight of 12-15. Independent? or does he require cues? what type of cues? And remember, all goals must have a time frame, condition, behavior and criteria. Measure something functional that the child can do as a result of therapeutic intervention. Make it functional within the school system, collaborate with Special Education teachers so it’s meaningful to them and able to be measured by them to judge overall progress! Use clear language, as jargon-free as possible, to make the IEP accessible to everyone involved, especially the parents. Consult with other team members and prioritize student needs. Describe what the student can do and in what conditions. Be specific. Consultation with the team about the student to receive a comprehensive overview of the student. Thank you again to our wonderful readers for offering your tips and suggestions for writing a great IEP. I am sure this will help so many therapists, parents, students, and teachers write more effective and concise IEPs. 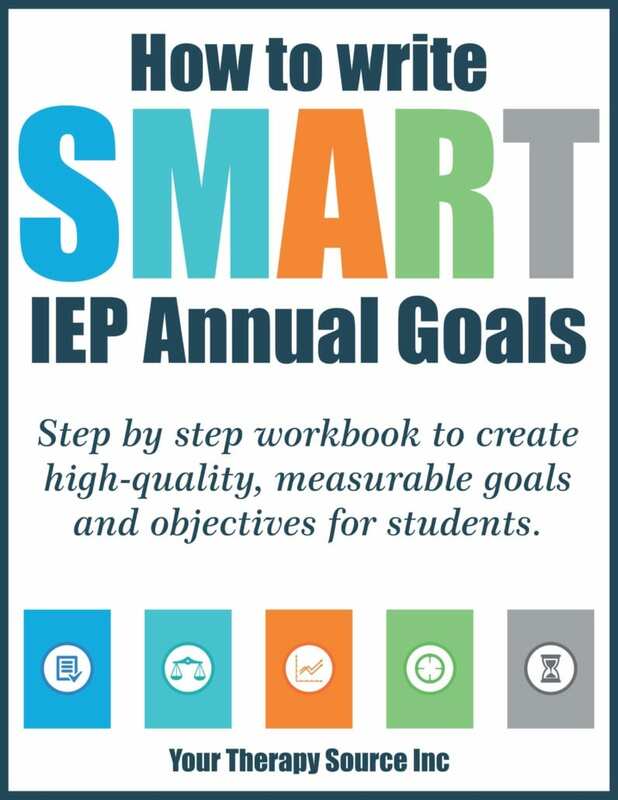 The How to Write IEP Goals Workbook digital download provides a step by step guide to help you create high-quality, measurable goals and objectives for students. Do you struggle to write measurable IEP goals? Are you finding it difficult to determine if a student is making progress? Are you short on time because you have to write so many IEPs and it becomes overwhelming? Once you practice writing effective present level of performance statements and SMART goals it will become much easier and faster to write measurable IEP goals and objectives for all your students. Please take a moment to answer our current survey. We always appreciate your opinions, perspectives and advice! Measurable IEP goals – How to write SMART Annual Goals What are Visual Spatial Relations and Why are They Important?